Have you ever had a Tavern before?? I have had this recipe for years, but never really new why it was named a "Tavern". It's very much like a "Sloppy Joe" or whatever name they may have in your region. 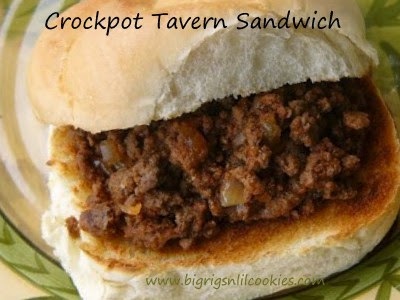 Thanks again to Wikipedia for giving me the answer... Tavern Sandwich is a regional term originating from Iowa for a "Sloppy Joe". I lived in Iowa for years, and still live very close to Iowa, but I am sure I didn't get the recipe from any one I know in the area. Oh well. That's what I get for not keeping track of where my recipes come from! This is a great crockpot recipe for your busy days. I brown the meat the night before, throw it all in the crockpot in the morning, and the guys could feed themselves! Have the slotted spoon close at hand, since these are super juicy. They go perfect on a crusty bun, and would be great with a side of mac and cheese! In skillet, brown ground beef; drain well. Place browned beef and remaining ingredients in crockpot. Stir well to mix all ingredients. Cover and cook on low setting for 8 - 10 hours. Interesting recipe! Sandwich looks yummy! Hi, I’m Anne from Life on the Funny Farm (http://annesfunnyfarm.blogspot.com), and I’m visiting from Farmgirl Friday. This looks really yummy. Like sloppy Joe's, only healthier/less processed. Thanks for sharing! I have never heard "Sloppy Joes" called "Taverns" before. I am from Nebraska and they are sloppy joes. I married and moved to northwest South Dakota where they are called "Wimpies." My Sister lives northwest of Des Moines. Robyn, I have never heard of "Wimpies" before either! Interesting. My Gram who is in Northeast Iowa, does call them "Maid Rites". That is the only other name I have heard for them. I've never heard of a tavern before. They look very similar to sloppy joes! They look delicious! Thanks for joining Foodie Friends Friday! Please come back on Sunday to VOTE! Sounds delicious!! Visiting from this gal cooks/marvelous mondays. Call it whatever you want to! It looks great to me! I've made Sloppy Joe's for years, it I like this name better!!! I'm your newest follower ;). I'd love for you to visit me! Just a little hint (I hope you don't mind), but you may want to remove "word verification" from your blog. Many bloggers won't comment if its on there. Just to let you know...this recipe is being featured at Weekend Potluck today. Please come by and grab your featured button. Have a wonderful weekend. Thanks so much for sharing this on Manic Monday!! Pinned and shared on FB and Twitter :) hope to see you next week!! I've never heard them called Taverns. Sloppy Joes, Maid Rights or Loose Meat Sandwiches. Whatever they're called, we love them. Curious how you came up with your blog title, it's a fun name. I love learning new things. I didn't know they were called Taverns. Thank you for sharing this at Wednesday Extravaganza! Come back today and vote for your favorite and maybe get a spot on my Wall of Fame! Thanks for linking up with the Clever Chicks this week, I hope you'll join us for the next hop! I've never heard them called Taverns, only SLoppy Joes! This recipe looks great, love that it's made in the crockpot. I grew up in northwest Iowa and we ate "taverns" all the time and called them that. I believe it was more of a northwest Iowa thing for those wondering. Carla - Thanks for the input! My days in Iowa, have always been in in the northeast part of the state. That must be how I missed out on these. I love the recipe, the name, and the story that goes with it! Thanks for the great recipe at our Celebrate365 slowcooker link party! Mix sauce ingredients and boil for 10 minutes. Add drained beef. Simmer for 30 minutes.